Wow! This week has gone by pretty fast! Things are going pretty good here. We heard our transfers on Saturday and... E. Lopez and I are going to stay in the same area together! Haha, that´s what I expected and I´m glad we´re not getting switched around already. 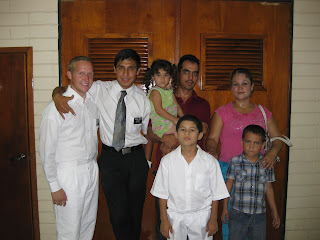 We didn´t end up getting to baptize the 2 people we thought we were. Unfortunately Jose Ramon´s esposa doesn´t want to get married still, but we´re going to continue visiting the Hermano. Hopefully his esposa will let us talk to her one of these days too.. Fernando and his parents decided that this coming wednesday was the best bet for when his family would be available. So we´re planning on baptizing him this next week!.. Even though things didn´t work out as planned we were able to baptize Leopoldo. We´re teaching him and his family right now. He really has been wanting to get baptized and is 10, his parents gave him permission and they all assisted the baptism this last saturday. It rain a little bit again today as we were walking around. I´m excited for this transfer and E. Lopez and I have a lot of good plans with how to work with the wards better. We want to have activities every week with the Youth, and also to go on divisions more with the members. Hope everybody is enjoying their summer! Thanks for all your love, support, and prayers. Til next week! Byeee.